We are a culture of email senders: Studies show that the average professional gets over 100 emails a day! If you’re sending email, you need to make it stand out. The easiest and most efficient way to do that is with a professional, dynamic email signature. How and why should you make one? Check out all the perks of having a dynamic email signature. First of all, making one is easy! Forget the HTML or any crazy code. You can quickly get a great looking signature by using an email signature maker. We created WiseStamp for that very reason. Within a few clicks and minutes, you can have a professionally designed, branded email signature that pulls dynamic content and engages your email recipients. Now as for why you need a signature: because it turns each email you send into a new business opportunity, and we have the stats to prove it! Research shows the more you brand your business, the better your sales will be. Presenting a brand consistently increases revenue by an average of 23 percent. That means you need to take each opportunity to present your brand and what better way than through email? With an email signature, you can brand each and every email you send. Email is not only for reading, it’s for interaction! You can engage your audience by adding useful, clickable info within your email instead of just text. A professional email signature should have interactive content that lets your readers discover more about you. 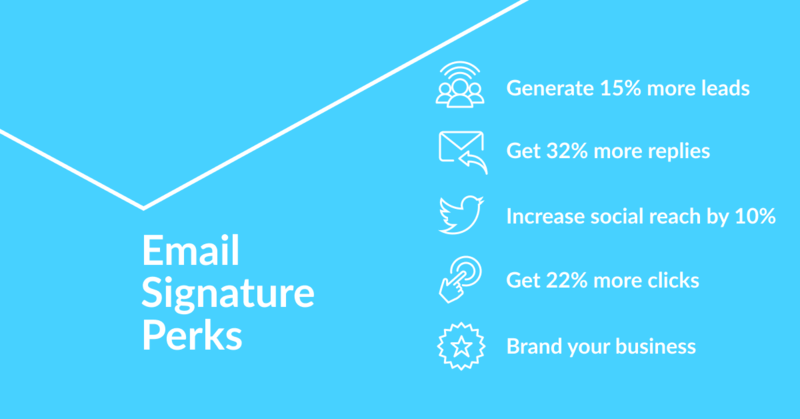 Having a signature like this will increase your email engagement by 22%! With WiseStamp’s social media apps, you can both link to your social media channel and pull dynamic content from it! That means you can feature your latest Tweet, Youtube video, Instagram photos and more right within your signature. You can also add call-to-action buttons that let your email recipients follow your social media with just a click. What’s the point of writing someone an email? Most of the time we want our recipient to take some sort of action like send a reply! Our data shows that our community of nearly 1 million users get a 32% higher email response rate than average. When you add a WiseStamp signature to your email, make sure you’re prepared for a fuller inbox of responses! What’s one of the best possible outcomes of sending email? Increasing your business leads and sales conversions. With an email signature like WiseStamp, you can optimize leads and conversions by 15%, which translates to big business! That’s why we say you turn each email you send into a new business opportunity with WiseStamp. Ready to get started with an easy-to-use email signature maker? Start creating your WiseStamp now—it’s free. And if you want to try our premium version for more features and customizability, we offer a 30-day money back guarantee (because we know you’ll fall in love with it!). I did everything and still the email signature does NOT work. Where did I go wrong?